Wiggins, Rosalind Cobb, Editor. Captain Paul Cuffe’s Logs and Letters, 1808 – 1817. 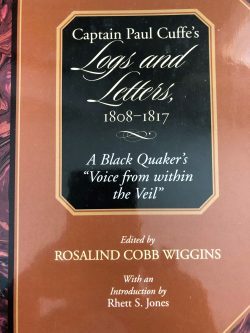 (A Black Quaker’s “Voice from Within the Veil”). Washington DC: Howard University Press, 1996. First Edition. Octavo, fine dust jacket, 529 pages including index. A few illustrations and map of Westport, MA. Signed by Wiggins. An As New copy. Cuffe was a free black shipbuilder, adventurer, businessman, ship’s captain, philanthropist, and man of faith. He was one of the few black Quakers in the early 1800s and an important figure in American Trade history. A charter school in Providence RI is named after him. $60.